13FOREST Gallery is pleased to present Etched & Carved, an exhibition of four printmakers, in conjunction with the Boston Printmakers 2017 North American Print Biennial. The process of printmaking as we know it today grew out of the fifth-century Chinese practice of carving an image into a block of wood and stamping the design onto fabric. This technique, called woodblock printing, became a popular form of image-making throughout the world. Woodblock printing is still practiced by contemporary artists, but the field of printmaking has greatly expanded to encompass such diverse processes as etching stone or metal, silk-screening, lithography and collage. Etched & Carved introduces four new artists to 13FOREST Gallery, all printmakers who demonstrate the wide variety of visual styles that can be achieved with printmaking. This exhibition is timed to coincide with the Boston Printmakers 2017 North American Print Biennial, opening nearby at The Lunder Arts Center at Lesley University College of Arts and Design in Cambridge on Saturday, January 27. The Boston Printmakers is an organization dedicated to promoting excellence and innovation in the field of printmaking, as well as encouraging public understanding and support for this unique art form. From the fine shading and delicate lines created by etching, to the bold, graphic shapes created through woodblock printing, Etched & Carved celebrates the process and aesthetic of printed art. 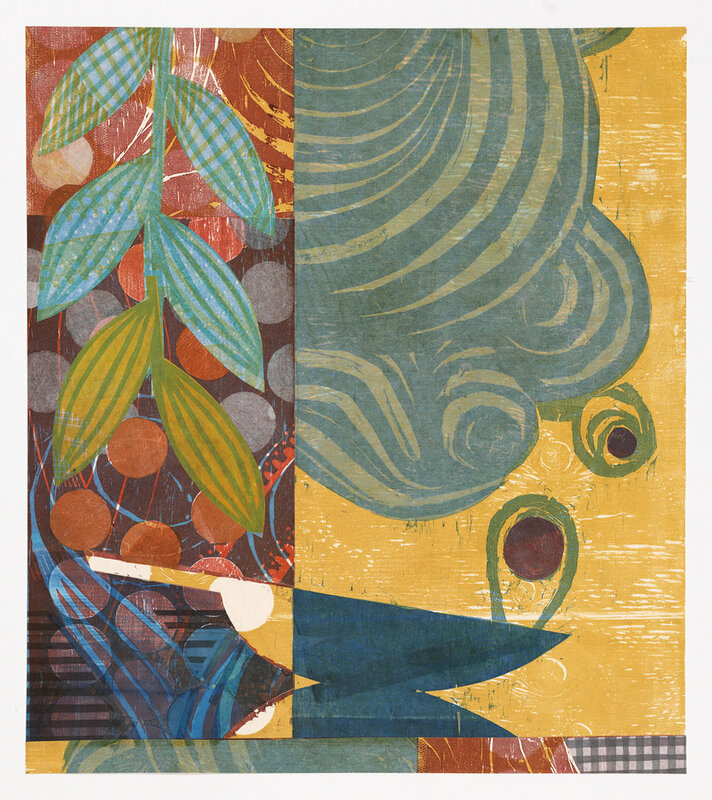 Peter Cangialosi is a monotype and woodcut printmaker living in Easthampton, Massachusetts. He’s a graduate of the Rhode Island School of Design and his work has appeared in various locations around Northampton, Amherst, and the Pioneer Valley. Several of his landscape monotypes are part of The Boston Athenaeum’s New England Prints and Photographs permanent collection. 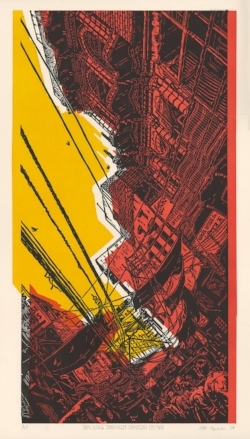 Andrew Stearns is a Boston-based printmaker. He holds a BFA in Printmaking and History of Art from Massachusetts College of Art and Design. His work explores the continuously shifting narratives of time and space through the investigation of historical moments. He has a particular interest in how history is recorded, remembered, or how it simply fades. Stearns recently had a solo exhibition titled Selective Histories at the Falcon's Nest Gallery in Gloucester, Massachusetts. Julia Talcott has been an artist as long as she can remember and has worked as an illustrator since 1985. She received her Bachelor of Fine Arts from Williams College in Williamstown, Massachusetts, and her Master of Fine Arts from the Cranbrook Academy of Art in Bloomfield Hills, Michigan. Since that time she has also added printmaker and teacher to her resume. Talcott currently teaches relief printmaking techniques at the Arsenal Center for the Arts in Watertown, Mass., as well as the Maud Morgan Arts Center in Cambridge, Mass. Mary Teichman graduated from the Cooper Union in New York in 1976. Her work has been included in more than 250 national and international invitational and juried exhibitions, and she was a member of the influential Printmaking Workshop in Manhattan during the 1970s and 80s. Her etchings are in the permanent collections of the Brooklyn Museum, The Boston Athenaeum, The New York Public Library and the Museum of the City of New York, among others. She is active in The Boston Printmakers and the Society of American Graphic Artists, as well as the Printmaker's Network of Southern New England.